To work with pallet is not a big deal we are offering you a DIY pallet project which is much easy and handy to achieve at home. Choose the dimensions for this DIY pallet accent table pattern and start separating up the pallet wood. We have used the spy bar and pallet breaker tool to strip up the pallet slats. Then we shaped up a wide rectangular top out of equally cut planks with nails and layering the glue where needed. 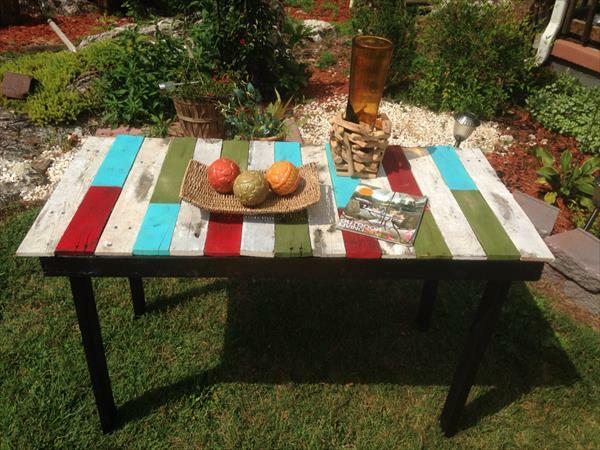 Top to this pallet table have been made colorful that give it much enchanting and enthralling preview and make it best for beach house interior. We sanded the wood just a little bit so that it retains that perfect rustic wood history in shape of that nail holes and wooden imperfections. You can use it as a pallet dining table, coffee table, breakfast table and also as an accent and decorative table.